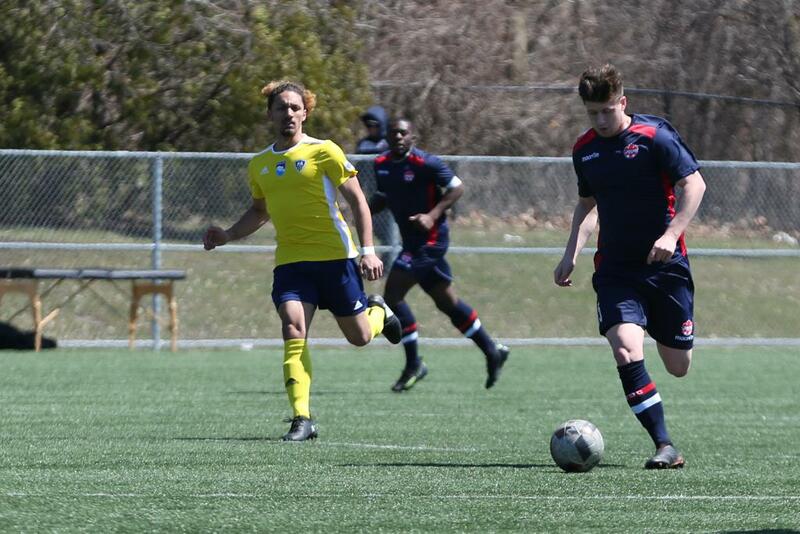 Raposo (22’), Lay (48’, 76’), Kloutsouniotis (85’, 90+2’), Kotsopoulos (90’) strike for Vaughan Azzurri SC as they eliminate North Mississauga SC from the League1 Cup after a 6-0 win on home turf. The match was a physical one from the get-go, as Vaughan came out hungry maintaining majority of the possession and keeping North Mississauga on the back foot. A breakthrough came in the 22nd minute of play when Ryan Raposo fired a shot outside the 18-yard-box beating the North Mississauga goalkeeper Andrew D’Souza. An on-field injury in the 26th minute of play would cause a delay in the first half, and consequently a dismissal for North Mississauga forcing them down to 10 men. This would change the tempo of the first half after 12-minutes of extra time was added on by the match official. North Mississauga found themselves with a chance to square up in the 5th minute of extra time after a cross was swung in across the face of goal, but Johnson Luyiga was unable to connect with it on the diving header. The Azzurri came out strong second half as well when Eddie Lay (48’) fired a shot from distance into the top left corner of the net giving goalkeeper D’Souza no chance. Vaughan would keep pressuring North Mississauga and caught them on the transition as Anthony Osorio switched the ball for Raposo, who passed it on to Lay (76’) as he made no mistake volleying into the back of the net for his second of the match. North Mississauga saw a couple chances in the second half hitting three crossbars/posts namely one from Jordan Prescod who bicycled a shot that hit bar down and his teammate was unable to put the rebound in hitting the outside of the post. Vaughan sealed up the win in the last seven minutes of the game as substitute Steve Kloutsouniotis (85’, 90+2’) neatly put a pair of goals away, as well as a goal from Jace Dayton Kotsopoulos (90’) who chipped the goalkeeper on a 1v1. This win sends Vaughan into the 3rd round of the League1 Cup where they will play the winner of Woodbridge SC vs Ottawa South United. Vaughan Azzurri will next host Master’s Futbol on June 2 (3:30 p.m.) at McNaughton Turf. Click here to keep up on all the news, goals, wins and statistics for the Azzurri men on their team page. North Mississauga SC will host Darby FC on June 3 (3:00 p.m.) at Hershey Centre 1. Click here to keep up on all the news, goals, wins and statistics for North Mississauga men on their team page.